This pocket shrine started as a small, plain matchbox that I covered with plush black velvet and glittery purple silk ribbon. The background image inside the box is a scan of a goddess figure, plus scans of my tubes of oil paint, reduced to fit the box. I added the word, “Create!” to the image, printed it and glued it in place. I also glued a small clear-ish piece of mica onto the image, for a bit of nature and depth. 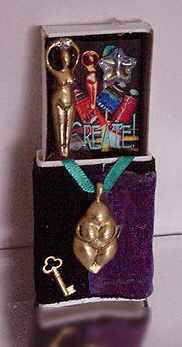 Then I glued the same goddess figure I’d scanned for the background, into the box. Because she was designed as a charm or bead, I put a small jewel in the opening between her hands. Also inside the box, I suspended an iridescent star on a thread. It swings freely when the shrine is displayed. Outside the matchbox, I have a small dollhouse key, suggesting the “key” to creativity. I also suspended a second goddess figure on a teal blue silk ribbon. She’s held in place with hot glue. The glue is very visible where it smooshed out onto the purple silk ribbon, but I don’t think it distracts enough from the shrine to try to remove it. Closed, the matchbox measures two inches tall.